Lip print readings are a fun compliment to any occasion—a tasty and interesting side dish of sorts that often ends up being the main attraction. 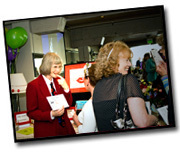 Jilly recommends Lipsology as a great icebreaker and conversation starter for groups of all sizes and ages. It’s not unusual to see Jilly down on one knee at a Bat Mitzvah or Mother’s Day Brunch conversing with a 5-year-olds about their artistic talents and great sense of humor. Or, cheek-to-cheek at a fundraiser or birthday party with a Navy Commander or CEO revealing their outstanding leadership qualities without ever knowing their rank or position. 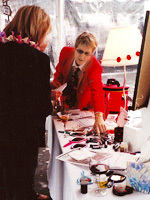 Lip print readings are often done at cocktail receptions, holiday celebrations, product launches, anniversaries, customer appreciation parties and more. For a list of ideas, check out the event list. Please contact Jilly for a complimentary consultation and price quote.